Austin is filled with music venues from classic live music joints to up-and-coming hot spots — much like the artists playing in them. There are more than 250 live music venues that feature everything from rock and blues to country and jazz every night of the week. A trip to Austin just isn’t complete without a little live music. And that’s why we made sure to highlight some of Austin’s best during Convening Leaders 2017 — nearly 50 local acts over six days. Austin’s opening-night celebration featured live music on three different stages. The Spazmatics brought down the house at Party With A Purpose on Monday night with a massive ’80s dance party. And attendees crossed off a bucket-list item with an intimate performance from Austin’s own living legend Willie Nelson at the closing party. Knowing everyone would want to continue the live-music experience beyond official events, we created Austin Live! After Hours — featuring complimentary access, drink specials and the best of Austin live music and entertainment at some of the most popular venues on Saturday, Sunday and Tuesday evenings. 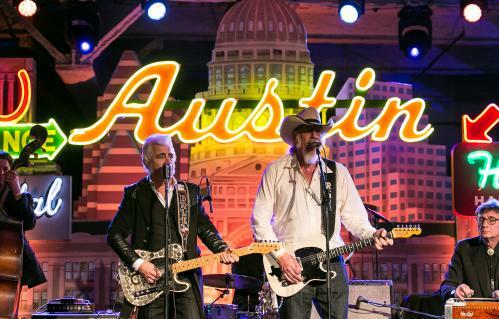 Enjoy some Austin tunes anytime with the CVB’s Music Austin playlist on Spotify.